Author: Kent Whitaker is an award winning author, and sometimes co-author, with writing partner Sheila Simmons. Whitaker’s books range from cookbooks, broad-based culinary titles, history books, as well as a few books for kids. In addition – Whitaker has excelled in advertising, copy writing, news, and sports writing as a credentialed member of the media. Kent’s passion for cooking, and enjoying good food with family and friends, has been part of his foodie professional life helping him with his work on TV, Radio, Print, and as a celebrity spokesperson. He has appeared on TV shows, and stations across the country including Food Network and Emeril Live where he won the Emeril Live Barbecue Contest. Kent is also the recipient of a Gold Medal for culinary writing by the American Authors Association. Whitaker has long proclaimed a love of history and cooking. He actually tries to combine the two in many of his books! His early, career away from cooking, includes producing a radio game show on Nashville’s historic WSM radio station while in high-school as part of an Explorers project. During college he worked at several newspapers including Sidelines which is the Middle Tennessee State University campus paper. Following college Whitaker moved to Chattanooga where he worked at the Chattanooga News-Free Press before leaving to publish his own regional sports publication based on golf. At this time he started working with local radio stations. Whitaker and his wife Ally hosted a NASCAR and racing themed show on ESPN Radio 1370 for several years and also hosted a racing show on the local FOX TV affiliate while the shows host was away on a project for a year. Sports: Kent is a credentialed sports writer covering NASCAR, IndyCar, ARCA Racing, The NFL, and more. Kent has appeared on the Food Network and other network television stations. He frequently hosts cooking classes throughout the South. He writes a cooking columns for newspapers and writes monthly articles for both The National Barbecue News and Tailgater Magazine. Kent hosts a weekly short format cooking show that is heard on over 50 affiliates across the country. Please visit our affiliate page. A dog-lover and advocate for local animal shelters and rescue organizations, Kent and his grilling buddy, Moses, served as spokesperson, and spokes dog, for ALPO®. Kent, Ally and Moses traveled the country presenting grilling and cooking demos promoting the idea of including your canine family members in on the backyard grilling fun. Kent gives human grilling and cooking tips while Moses enjoys ALPO® dog food. Kent has worked with several national brands, as well as smaller regional businesses, in their marketing efforts. This includes receiving professional media training classes. Some of the companies include Check Mark, ALPO, TimberTech, and more. Kent has also worked with companies who have served as product sponsors. Kent has worked with Vermont Castings, Pabst Blue Ribbon, E.H. Campbell Trading, Big Show Foods, and others. 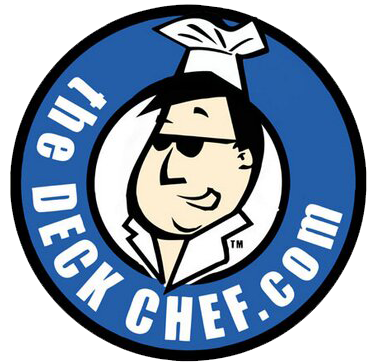 So how does a guy get a nickname like The Deck Chef? Get a deck, start buying grills and smokers like baseball cards and transfer your cooking skills to the back porch. Invite your friends over, ask every chef you meet questions, interview meat and three cooks, grandmothers, pit masters and such. Collect recipes, start cooking at all times of the day, take some classes and create your own dishes. Kent is also a member of the United States Coast Guard Auxiliary and severed on the National Staff as an AUXCHEF and National Branch Chief. He currently serves the USCG 8th Eastern. Kent and his wife Ally live in East Tennessee with one ARMY Strong son, Macee (Mace), a Golden Retriever named Moses a Shiatsu named Lucy and a Great Dane named King.